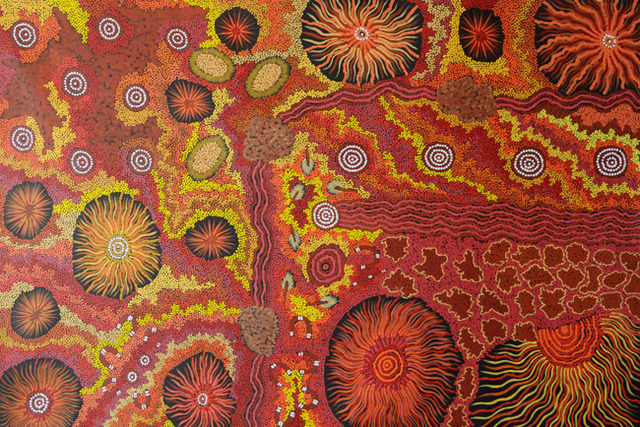 A trip to Australia would not be complete without learning about the aboriginal people and aboriginal art. You can find examples of the art on every cup, bag, pencil, and t-shirt in every souvenir shop in Sydney. I knew very little of the culture and the struggles of the aboriginal people before I went to Sydney. To be honest, the reason I even paid attention while there was because I was looking for some inspiration for my next tattoo and the designs and colors of aboriginal art is amazing. But, I decided once I returned I would read about why their art is so prevalent in the modern society of Australia. I came across Yilpi Marks and her art while doing some research. I saw her art and was instantly hypnotizing by the color and movement. Like most aboriginal artist, Yilpi learned about the Aboriginal Dreamtime Stories which is reflected in her art by her parents and grandparents. 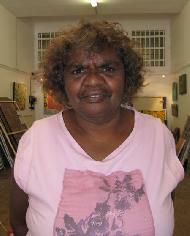 Dreamtime Stories is a creation mythology reflecting the Aboriginal hunter-gather lifestyle. It tells the stories of their ancestors. It is inspiring how this art has giving the aboriginal people the opportunity to preserve their heritage and cement their legacy as a significant part of Australian Culture. Thanks to www.aboriginalartstore.com.au for the great information. I love this post! The artwork is amazing. I would love to travel to Austrailia and experience the culture and see the artwork myself. Thanks for sharing! Thanks Ana. I love the art, I thought it was strange to see all the tourist shops have commercialized the art, but learned that it really has given a lot of the aboriginal people a lifestyle they wouldn’t otherwise have. Pretty cool. Australia is great. If you get a chance, go. A really great post. Thanks for sharing the link another one I am off to explore! Thanks Julie. Check it out. The paintings are amazing.